Here’s the first excerpt from Valley of Shadows I’ll be sharing with you this evening. Hope you enjoy! I ARRIVE at the top of the grand front staircase, taking a moment to admire the view down its sinuous, imposing length. With definite emphasis on the length. I love this gleaming oak behemoth. Who knows how many ancient acres of stately, now deceased oaks were deforested so I could one day enjoy such an elegant and stately way to convey myself from floor to floor. I’m standing on a shitload of arboreal corpses. You know what, I spend entirely too much time dialoguing with the dead. It might be making me strange. I’ll leave off contemplating my eccentricities and go downstairs. If I start now I’ll make it all the way to the foyer by lunchtime. Yeah, this place is pretty ginormous, absurdly oversized for one person, but that’s a large part of why I like it so much. There’s just so much to do and see in here. Hours of entertainment walking from room to room. I fixed it up and modernized the plumbing and wiring, but I tried to keep the essential quirky character of the place intact. It came with a few original inhabitants and several residual imprints on the ether scattered here and there, but nothing I couldn’t handle. Couple of crossovers and a thorough psychic house-cleaning later, and we’re all good now. But not entirely alone, or so it would seem. I wasn’t here long when I discovered the house also had an additional, unadvertised extra. It came not only furnished, but with a resident domestic. At least, she used to live here. Mrs. Potts, bless her Alzheimer-ized old head. Thirty years she ran this place for the woman who last owned it. Until the disease reduced poor Mrs. P. to a vacuous but completely innocuous shell of herself. And speaking of the last owner, when I took possession, I was really hoping Jemima Jones would still be here so I could ask her why she left The Boarding House to me. At least, that’s what the sign I inherited along with the house proclaimed the former Birchwood Manor was redubbed when she put it into service as a bed and breakfast. Pehaps it was the entertainment value inherent in the irony of that appellation. Given mine, that is. Joyce James? James Joyce? The Boarding House? I certainly got a hoot out of it. So much so, I repainted the sign and rehung it. Hey, it makes me laugh. Not a lot does, these days. And here comes Mrs. Potts now, teetering on shuffly little old lady feet across the expensive imported Italian tiles that comprise the stunning mosaics splayed out all over the foyer floor. Sometimes she slips through the casual constraints of the old folks‟ home three streets over to somehow always make her way here. She’s harmless, hardly ever breaks anything, and is occasionally lucid enough to bake the most amazing blueberry muffins you’ve ever tasted. I’ll bet in her prime she was a culinary force truly to be reckoned with. And here she is, once again, some part of the woman she was briefly resurrected and drawn here by no longer binding ties of responsibility and obligation. The disease retired her a decade ago, but she doesn’t know that. She doesn’t know much anymore, bless her, and yet her sparse remaining fragments periodically shine through the confusion obscuring what’s left of her. Putting together what little remains leaves me with a tantalizing personality puzzle. I wish I’d known her when she was younger. But that will never happen. That woman is mostly dead and gone. Although the body is still very much living. It’s sad to see what’s left of her walking about like this, literally a living ghost. I’d better let her keepers know she’s slipped their surly bonds once more. They probably haven’t even missed her yet. I commence my descent and pull out my cell to make the call. I’ve got The Shady Rest Retirement Home on speed dial. They pick up on the first ring. “Cal is on his way, Mr. James,” Virginia’s resigned voice informs me before I can get a word out. Oh, so I was wrong. Someone’s paying attention today. Excellent. Not the first time we’ve had this conversation. I re-holster my cell and hit the main floor. Mrs. Potts seems oblivious to my presence and intent on plotting a course for the kitchen, although her trajectory could change at any moment. She could just as easily end up in Albuquerque as anywhere in my house. At first I think she’s going to teeter on by without so much as a “Who the heck are you again?”, but then her birdlike head floats around on her scrawny neck and she gives me a vague, inscrutable smile. “Good morning, Khnumhotep,” she quavers and nods knowingly. She always calls me that. It’s a no-brainer it’s Egyptian, so I tried Googling it and actually got a hit. Apparently Khnumhotep was the name of one of the two male occupants of a tomb in Saqqara who may or may not have been Ancient Egypt’s first gay couple on record. The archaeological jury is still out on their orientation. And they were manicurists. Some things never change. Anyway, that’s the origin of the name, but why she insists on applying it to me—bit of a mystery. My background is strictly Anglo-Saxon, but I’ve had many other ethnic origins erroneously attributed to me because of my coloring. “Dusky” is a descriptor I’ve heard more than once. But being taken for a possibly gay ancient Egyptian hairdresser, or whatever, is one for the books. In an attempt to track down where this nickname—and Mrs. P.—is coming from, I’ve asked around, attempting to find out if either Mrs. Potts or Jemima Jones had any Egyptian inclinations, but that doesn’t seem to be the case. Nothing in the remaining effects in the house would lead one to that conclusion, either. Maybe it’s nothing more than her memory dredging up something randomly whimsical to label me with. The way her mind is now, it’s really hard to say. “I’m just on my way to feed the cat,” she wispily warbles. That’s nice. Would be even better if I had one. I’ll leave her to it, then. Satisfying the nutritional requirements of nonexistent felines should keep her out of trouble until Cal comes to collect her. Me, I’m outta here to see to mine. 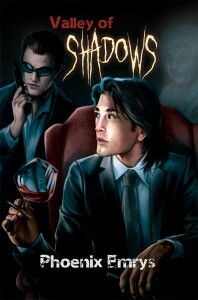 Valley of Shadows Release Party! Hello! **bamf, bamf** Is this thing on? Greetings and welcome to my very first ever Virtual Release Party for my debut novel Valley of Shadows. I’m pretty excited to be here, and glad to see you too. Over the course of the next four or so hours I’ll be posting some excerpts, answering questions if you got’ em, and giving away a free copy of the Valley of Shadows ebook. Oh, and of course taking your personalization requests for the Virtual Book Signing. To enter the contest, simply leave a comment here. At the conclusion of the festivities I will post the name of the winner of the free ebook on my blog. To get your book signed, post a comment to the previous post, with your order number and what you would like me to write in your book. Thanks for stopping by, and now, let’s party! 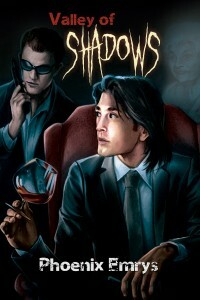 Get a signed copy of Valley of Shadows! 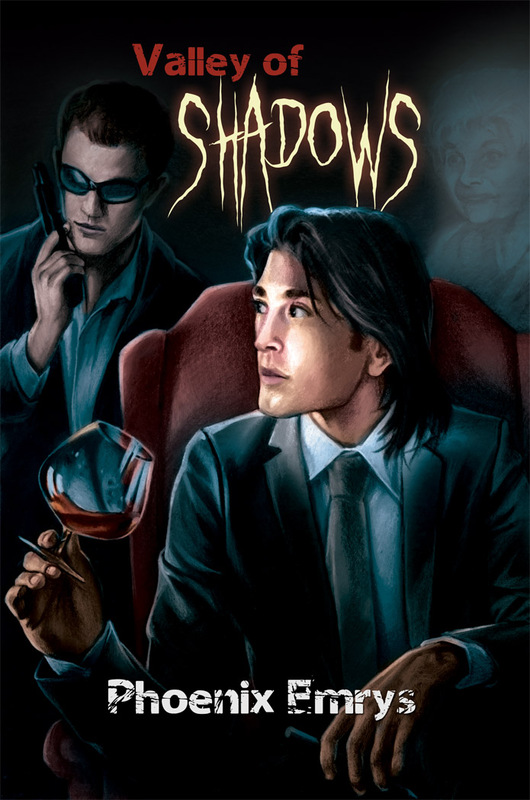 Purchase a signed copy of Valley of Shadows by Phoenix Emrys and leave a note on this post with any personalization request and your order number. Phoenix will personalize your book before it’s shipped to you! It was great chatting with you all today. I love to hear from you, so feel free to visit my site and ask questions or leave comments. Happy reading from Zach, Angelo, Matt, Jared, and (of course) me! A to Z Release Party! Hi everybody, and welcome to the A to Z release party! If you would like to request that your paperback copy of A to Z be autographed, please reply to the previous post (click on the individual post to be taken to a page where you can leave comments). Later on, I’ll be posting excerpts from A to Z, as well as a short story I have about Matt and Jared. I’ll also be giving away an electronic copy of A to Z. Please feel free to ask any questions you might have about Promises or A to Z. I’ll be here for the next four hours. I’m looking forward to chatting with you all. Would you like a signed copy of A to Z by Marie Sexton? If so, leave your DSP order number and your personalization request in the comments to this post! Well, time to say good-bye! I hope you enjoyed a sneak peak at my latest novel, “Jack and Dave.” Early reader reviews are very positive which puts a smile on my face. I hope you get an opportunity to get yourself a copy today’s release and remember: One lucky buyer will receive a full refund making their purchase free! This opportunity ends at midnight tonight. If you want a personally signed copy of the paperback, just leave a note for us, and I’ll be sure to take care of that for you. If you didn’t get a chance to ask me your burning question, you can always write to me at: johnsimpsonbooks@hotmail.com and I’ll get back to you as quickly as I can. As always, you can visit my website at: Johnsimpsonbooks.com to get the latest news on what’s happening at John Simpson Books. Thank you all for taking time out of your busy schedule to spend part of it with me. I appreciate your support more than you know! Dave headed down the street and turned right at the corner headed toward one of Reading‟s oldest gay bars. The Purple Door had been around for at least thirty years and stood as the symbol of the gay community in the city, and as Dave approached, he had an odd tension in his stomach. Somehow he felt that once he crossed the threshold of the bar, he was identified to the community at large as a homosexual. Considering this was something he had fought against so hard in the military, crossing through the door was like breaking a curse. When he walked in, all the heads in the place turned to check out who was coming in. The club had a bar formed in a big oval in the middle of the room with a small dance floor off to one side. There was no band, just pre-recorded music played on loop. The light was low, and it took Dave a minute for his vision to adjust to the atmosphere. As he took a seat at the bar, all eyes were still focused on him as the bartender headed his way. “What‟ll be?” the cute bartender asked. Weren’t all gay bartenders cute? “Ah, that would explain the high and tight,” the bartender said, referring to Dave‟s hair. “Yeah, I kinda like it, though,” Dave replied. “Don‟t get me wrong, I like it too. Dan‟s my name,” the bartender said, holding out his hand. “Nah, I‟ll take your word for it. First drink is on the house, Marine,” Dan said. “Thanks, nice of you,” Dave replied with a smile that seemed to light up the bar. As Dave looked around, he found most of the men in the bar were still staring at him. He nodded a few times, and the guys nodded back or waved. It was obvious that more than one man was intensely interested in Dave, but none approached him directly. As he finished his drink, Dan brought another and set it down. “This is from Nick over there at the end of the bar,” Dan said and smiled again. “I don‟t think you‟ll be paying for any drinks in here tonight,” he continued with a laugh. Request your signed copy of Jack and Dave here! Respond to this post with your order number from Dreamspinner’s web site and your personalization request if you have one so John can get your signed copies to you as quickly as possible. He will accept requests until midnight Eastern time on Friday, Feb. 26, so get your requests in early! I look forward to being with everyone tomorrow, February 26th, 2010 to welcome my latest release, “Jack and Dave,” into being. I look forward to talking to everyone!